Z-397 Guard USB/RS-485/RS-422 converter is designed for converting of RS-485 interface to the USB interface. Using of Z-397 Guard USB/RS-485/RS-422 converter with terminal software speed up and facilitates the diagnosis and launch RS-485 networks based on Iron Logic ACS network controllers. The converter has galvanical isolation of the RS-485 interface and PC and there is no need to have a separate power supply for it. 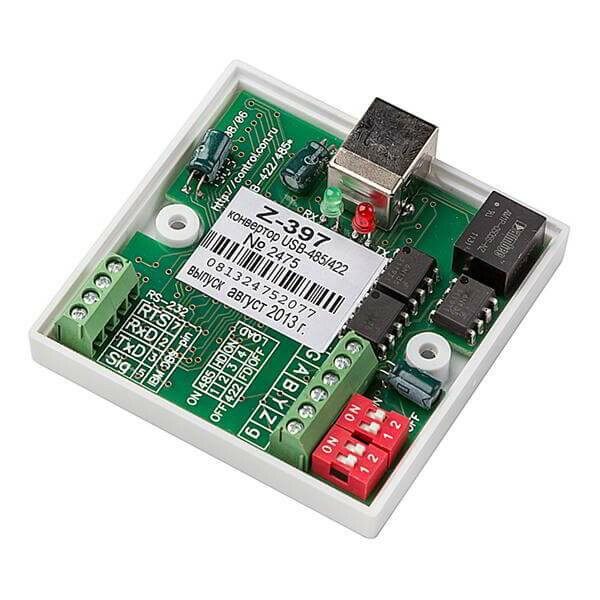 Z-397 Guard USB/RS-485/RS-422 converter automatically detects the speed and direction of the data exchange and is equipped with transmission direction indicator. After connecting of converter to the PC and installation of drivers, the new virtual COM-port will be added to the operation system. It's allow to connect the ACS software which working using COM-port interfaces (eg Guard Light or Guard Commander).